The Difference Between Liquid Chlorine and Granular Shock? 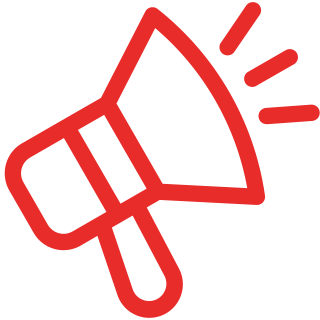 What is the Difference Between Liquid Chlorine Shock and Granular Shock? Have you ever been in this scenario? You need chlorine for your pool, so you come into the store and see hundreds of products. You see people walking out with gold jugs, but also in small packages and even buckets! If you are from Texas, you may have never even seen it in liquid form. What’s the difference? Which one should you use? There are many types of pool shock, let’s sort out this tangled mess once and for all. To clarify, the real difference does not lie in the form that it comes in, but from the difference between whether it is unstabilized or stabilized. Liquid chlorine and granular shock have the same active chemical that sanitizes your pool, what changes is the strength and the way you use it. A quick disclaimer: The word “chlorine” is often used inappropriately, but has become the generic term for the world’s most common sanitizer. Real chlorine is only available in gaseous form. The kind used in your pool (hypochlorous acid) is derived from this form and mixed with various chemicals to make it a solid or liquid. Chlorine is the most cost-effective way to sanitize your pool. It has been the product of choice for almost 100 years. It is safe enough to sanitize drinking water and powerful enough, in the right concentrations, to kill bacteria, germs and viruses. It also oxidizes as it sanitizes, helping to keep your pool clear. With that in mind, let’s dive into more detail. Differences between Stabilized and Unstabilized Chlorine. Stabilized chlorine is used as a disinfectant in automatic chlorinators. It is the best for daily sanitizing because it lasts longer. This type comes in tabs (or pucks) or in granular form and can be distributed in a variety of ways. Floating chlorinators use tabs and distribute chemicals over time. 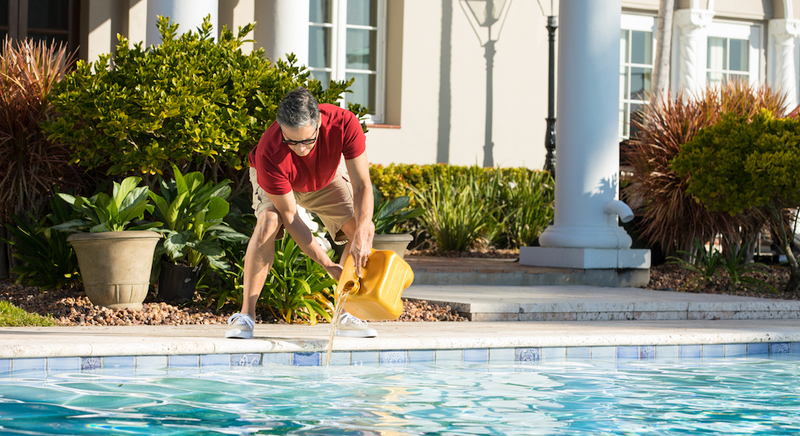 Most floating chlorinators can hold anywhere from two to eight weeks worth of chlorine, depending on conditions such as the season and your pool's size. An automatic feeder works in a similar way, allowing it to mix with the pool water slowly and deliberately. This type generally comes in a large bucket. Unstabilized chlorine is used for weekly shocking. In addition, it is used to give your pool a large dose of chlorine to sanitize the water quickly after heavy use. Unstabilized chlorine provides a quick, high concentration, killing bacteria and other nasty things in the water. It is also helpful in controlling algae, destroying organic contaminants and restoring clarity. It is best to wait before going into the pool because liquid chlorine levels will be high after shocking, but it will be safe to swim after only 24 hours. Each chlorine compound is designed for a specific purpose. 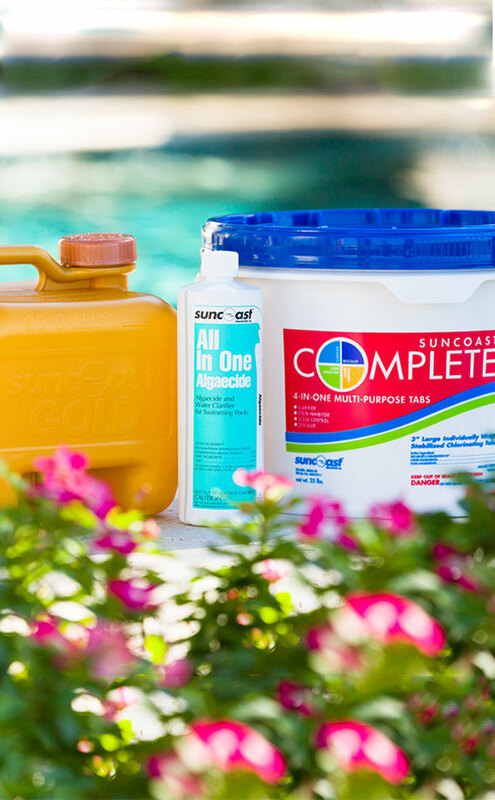 Using these two types in conjunction with one another will keep your pool clean, clear and sparkling! Now that we know the difference between stabilized and unstabilized, let’s look at the differences between liquid and powdered (or granular) shock. Both of these types of chlorine are considered unstabilized. However, there are some major similarities and differences. Some powdered shock can be poured directly into the pool, but most must be mixed in water to prevent staining. Make sure to read the instructions carefully. If there are any grains left at the bottom of the pool, make sure to sweep them out quickly. Some people prefer the smaller packages because they transport easily. Most of our customers prefer liquid chlorine for its refillable qualities. It’s also nicer on the wallet. Your local Pinch A Penny store associates will fill your jugs for you. They will also provide trays for your car so you don’t have to worry about a mess! In the end, all types of chlorine will disinfect your pool. The type that you use for weekly shocking is largely up to you. Suncoast Gold Liquid Chlorinating Shock is the freshest and strongest available today. Many factors can affect your decision, such as budget, pool size, and climate. It is best to talk to the experts at your local Pinch A Penny store for expert advice and friendly service! Also, check your levels weekly, as some shock products may affect pH. For your convenience, Pinch A Penny offers FREE water testing. No matter which product you choose, do not mix products together. Chlorine is a hazardous material. Always handle with care and take proper safety precautions, such as wearing gloves and goggles, before handling and when using. For salt pools: Salinity Surge Shock or Oxidizing Shock -allows your pool to be used in 15 minutes. Learn the ABC's of Pool Care Maintaining the perfect pool is as easy as ABC when you follow our simple steps!